Non-executable symbolic notations just sit there, so we might reasonably call them dead languages, in the sense of non-vital, but perhaps in the more usual sense as well: headed the way of Latin. To have your writing surface come alive with self-executing symbols is to enter the world of live languages, of which we have a growing number. Calculators were the cutting edge of the live language movement, cheaper and more portable than computers, ever more programmable, and in many ways closer to the math, with primitives for doing trig, standard deviation and, more recently, plotting curves. But computers have come a long way in terms of the price/performance ratio and the live language movement is entering a new phase with an even greater variety of pedagogical opportunities. I've been making the case for Python as a first language, to be learned in conjunction with math topics, given its clean syntax and intuitive implementation of time-tested concepts. However, I also consistently make the case that no serious student should stop at one language, which is to artificially deprive oneself of the vast riches our cultures have to offer. In an effort to practice what I preach, I've been recently delving into the J language, thanks to a tip from Fraser Jackson, who'd been perusing some of my web-based evangelism on behalf of Python (Urner, 4). In particular, he'd been looking at a paper where I compare Python to a first love (the first language I encountered at Princeton): APL (A Programming Language). J is a next generation APL, again by APL's architect Ken Iverson, in collaboration with Roger Hui. Unlike APL, which required a specialized keyboard with greek-looking symbols, J uses the regular ASCII character set. However, like APL, it is designed to be an executable math notation. Like all languages suitable for on-the-fly investigations and explorations, J is interactive: type an expression, get an immediate evaluation. Scheme, ISETL, Logo and Python all feature this immediate feedback cycle, a shell mode. Java and C/C++ do not. J is very math-focused. Iverson has written a companion to Concrete Mathematics, a classic text book for computer science majors, but relevant to anyone (it reminds me of Conway's and Guy's The Book of Numbers, another classic, for which Iverson is doing another companion guide). Certainly the next time I chat with a parent at some homeschooler conference (I've been an invited speaker to such), and said parent confesses to using Saxon Math at home, I'll say "that's great -- have you checked into using it in complement with J?". A conversation might ensue from there. Certainly we have plenty of opportunities here to supplement Saxon, or other math learning texts, with additional J-based materials, and make them freely available to students over the internet. Just to delve into J a bit, let's quote from the console for awhile and see what makes it fun. Right off the bat, you find some high level verbs (as they're called), like q: which outputs the prime factors of a number (up to some large limit). We can assign this dual-action to a name of our own choosing, provided we look at the pattern. It's the application of two monadic functions: q: spits out an array and ~. grabs the unique elements. then what we want is unique(factors(n)). f(g(x)) is simply f g x in J, provided both f and g are monadic (i.e. accept one element on the right). Now suppose we want a single verb that captures the sense of (f(g(x)) -- except we're not providing any argument (no x). This requires the use of a conjunction, @, which, in the case of monadic functions, simply glues them together. However, if what we want is a new verb, containing the sense of the whole operation, but without a noun, then we need @ to glue our verbs together. @ is called a conjunction, meaning it takes two verbs as arguments (adverbs take only one verb, / being an adverb we've used previously, as in */ q:). In the traditional K-12 curriculum, we introduce primes versus composite numbers in connection with factoring. We give some attention to the GCD and LCM, perhaps in connection with rational numbers i.e. fractions. In order to simplify or reduce a fraction, you in effect divide out any greatest divisor in common between the numerator and denominator. J has the dyadic verb +. which means GCD when placed between integers. However, once these basics are introduced, the traditional K-12 curriculum is usually in a big hurry to escape the pure integers, by way of fractions, and on to reals, and so it doesn't allow any more time with simple number theory concepts, which I think is poor design. The concepts of GCD and prime number would anchor better if we did more to nail them down, meaning linked them to other nodes in the curriculum more tightly. For example, if two integers have no factors in common other than 1, we say they're relatively prime, or coprime. (b) those which do not. (a.2) those which merely share factors. For example, 27 has a divisor of 3, but 6, while it shares 3 as a factor, doesn't divide into 27 without remainder. 8, on the other hand, doesn't even share factors with 27, meaning, of course, it can't divide it either (or it would itself be a factor). Using J's primitives, we can find all positives <= n with no factors in common (the so-called "totatives of n" -- the number of which is the "totient of n"), by using the dyadic GCD verb (takes two arguments). Let's put n on one side, and an array 1...n on the other (in this case, either order would work). J is especially powerful because, like APL, it's about as easy to operate with arrays (including multi-dimensional) as with scalars. Likewise, if we flip the 1s to 0s and 0s to 1s, we'll get those numbers with factors in common. Putting all this together, we have strategies for outputting the totatives (i.e. positives <= N and coprime to N), as well as the non-totatives (positives <= N but with factors in common) and the divisors (positives <= N which divide into N with no remainder). pos =. >: i.y. NB. non zero positives <= y. The results get assigned to pos, which then goes against 12 using the GCD verb. (Note, 8) The output is compared to 1 using = and gives an array of 1s and 0s as discussed above, which is then used to pick out just the totatives. pos =. >: i.y. NB. non zero positives < or equal to y. The only difference is an equal sign was replaced with a less than sign, which exchanges 1s and 0s from the previous output (which is interimly stored in sel). Now we'd like to spit out the true divisors of n. We might as well start with the non-totients, with the further restriction that no remainder is left when dividing a candidate into the target. The number of totatives of n is called the totient of n, which we may define simply as the length of the list returned by tots. The totient concept has a lot of relevance in number theory, and we could and should show some of this relevance -- even to 7th or 8th graders when in preview mode. For example, Euler's theorem states that if you take some base integer with no factors in common with n, and raise that base to the totient(n) power, and then divide by n, the remainder is always 1. The proof isn't difficult, but it can wait. The important thing at the introductory level is (a) to get the meaning of a theorem and (b) to test it, play with it, by implementing it in an executable form. y. | x. ^ totient y.    NB. left argument is x. and right is y. This version of an "Euler's Theorem tester" will fail when the powers get high enough to push the result into a floating point number, in advance of dividing by the right argument. totient 205          NB. to what power was our base of 3 raised? This limitation may be overcome using an extended precision symbol x, which becomes part of a number's format. Just as 3r4 is the format of a rational number, and 3j4 the format of a complex number, so is 2x the format of an extended precision integer of value 2. An extended precision integer raised to power invokes different (slower, precision-preserving) algorithms in the J interpreter. To get around the limitations of ordinary console output, when it comes to these super large extended precision numbers, we need to draw on one of J's pre-scripted utility functions, xfmt. A deeper problem here is, even if we add extended precision, our strategy of raising a base to a large power, only to divide to get a remainder, is very inefficient. If you try 3 euler 200005 with the above version, you will get the right answer, but the computer will start taking awhile, as 3^totient(200005) is a rather big number to find (even though the interpreter knows some short cuts). A much better approach is to apply a "divide as you go" strategy. That keeps the computation from interimly skyrocketing through the roof on an exponential trajectory. This optimization is accomplished internally by the interpreter, if triggered by conjoining exponentiation to the residue operator with @ as shown below. This is starting to be a more advanced level of J than we would probably need at first, but it's good to know that the language designers have given us these streamlining powers. Any products of these totatives, divided by 12, will have a remainder that's likewise one of these totatives. We can generate a multiplication table after defining the verb x12, which multiplies and gets the remainder after dividing by 12. The & binds the 12 to the dyadic |, making 12&| a monad, which in turn applies to the output of dyadic * (multiplication). The @ conjunction is used pretty much as before, to compose the 12&| monad with the * dyad. When the function on the left is dyadic, the pattern changes: f(g(x)) means x f g(x) in that case, called a hook pattern (there's also a fork pattern). Note also that every totative of 12 has an inverse, meaning a paired element such that the product is 1. 1 is that element which has no effect when used with our x12 -- which is why it's called an identity element. 1, 5 and 7 are their own inverses (reading along the diagonal of the table). Multiplication with x12 is also associative. Letting the generic multiplier * stand in for x12, we might write: t1 * (t2 * t3) is always the same as (t1 * t2) * t3, which in turn means that t1 * t2 * t3 is unambiguous even without parentheses. Given multiplication modulo M is also commutative, this is a commutative group as well (also known as an Abelian group). Some of the elements in the table do not appear in the header or leftmost column, meaning we are not seeing closure. However, if instead of composite number 12, we take any prime number Z as our modulus, then we get commutativity, closure and associativity under addition (abelian group), plus the same properties under multiplication (another abelian group). Finally, we have the distributive property linking the two operations i.e. a*(b+c) = a*b + a*c.
And these are all the properties you need to achieve fieldhood (abelian grouphood for both + and *, along with distributivity to link them). J will spit out the nth prime number Z given the p: verb. Note closure, presence of an inverse, commutativity etc. Putting all this together, since we have closure for these sets of totatives of M, multiplied modulo M, we can raise them to powers, i.e. multiply them by themselves any number of times, and always get back totatives as a result. Going across in the 2-dimensional arrays below, we're raising our totatives to higher powers modulo N, starting with the 0th power (always returns 1), and proceeding through the to the totient(N) power -- plus four more powers for good measure. pow=. y.&| @ ^            NB. define raising to a power, modulo y. The dyadic version of / makes the verb to its left output a table obtained from row and column arguments. The verb in this case is powering modulo y. (i.e. pow in the previous definition). Each totative is subjected to the series of exponents by the modified verb, giving the rows of our tables. Remembering Euler's Theorem, we would expect every element, raised to the totient power, to output 1. 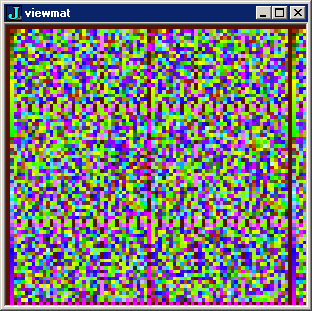 Indeed, the arrays above show columns of 1s five columns in from the right, in the totient power position. 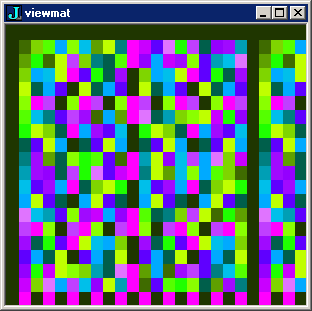 J can help us find such patterns with viewmat, a verb for translating arrays of numbers into arrays of colored cells. Note the leftmost column is solid brown. This is a column of ones, corresponding to the totatives being raised to the 0th power. The next solid brown column corresponds to the 16th power of each totative, where 16 is the totient of 17. The modulus has been increased. Again, we get a second solid brown column at the totient power. The totient of 79 is 78 (is one less than p whenever p is prime). Since 1 to any power is 1, we would expect this solid brown column to reappear at every integral multiple of the totient. Note that we find brown cells, corresponding to 1s, scattered throughout these mosaics. Some totatives have a higher periodicity -- but they all align on integral multiples of the totient. The same pattern repeats. Remember, the modulus need not be a prime for Euler's Theorem to work. The color palette varies from one pattern to the next, depending on the range of values being represented. The first totative, raised to successive powers in the first row, is always 1, meaning the values all the way across are 1. 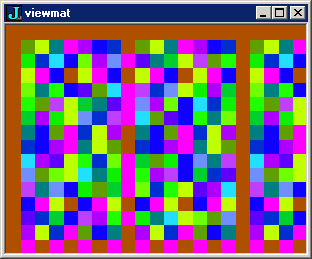 This explains why the first row in each mosaic is the same color as the leftmost. The highest totative always oscillates between itself and 1. Curriculum segments connecting these nodes would be traversed at different depths in the different grades. In 7th or 8th grade, we might cover the concepts of divisors, totatives and totient, along with prime, composite, GCD and LCM. Euclid's Algorithm would be exercised. In a later grade, but still before college, we would return to this discussion and look at some additional properties of totients, as well as these abstract algebra concepts of group, field and ring. The extended Euclidean algorithm might be used, including to find multiplicative inverses modulo N.
Euler's Theorem and Fermat's Little Theorem would be introduced on maybe a third pass, this time with a focus on the RSA algorithm, which uses Euler's Theorem to encipher and decipher a message, by raising to powers modulo the public key. None of this material is necessarily to the exclusion of other important topics. 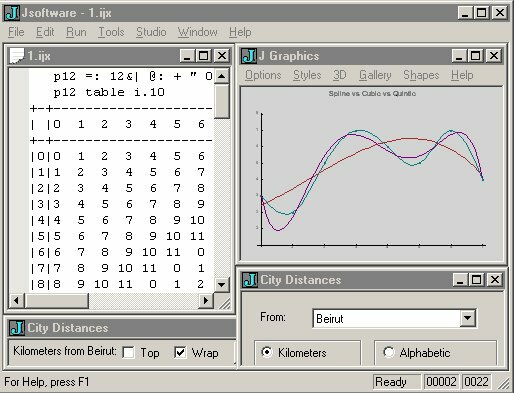 J is well endowed as a graph plotter, and has many capabilities with polynomials, trigonometry, statistics, vectors and matrices, derivatives and integrals. Nor are we limited to using J. Inert notations did not facilitate quick and accurate explorations. Live languages, perhaps taught with the aid of computer projectors, may spark a Renaissance in math learning. Now that we have very affordable (i.e. free), powerful, live languages, such as Python, Scheme, and J, we're poised for a breakthrough to the next chapter in mathematics pedagogy. The breakthrough will first occur, indeed has already occured, in the colleges and universities, where live languages are considered part of the status quo. Next we'll see increasing live language use in the home schooling environment, where the necessary ingredients are often already present (and top-heavy bureaucracies absent). And finally, we'll experience breakthrough in the pre-college classroom, as grade school teachers become more savvy about their options, and students and their parents become more informed about what an average mathematics education is going to be like in the 21st century. \system\extras\labs\livetexts\grade8-7.ijt on any freely downloaded copy (path given in Windows format). (some symbols here we haven't defined in this essay, plus instead of counting totatives, which is inefficient, this phrase uses the built in prime factors verb (q:), extracts the unique ones (~. ), and runs them through an algorithm originally designed by Euler to compute the totient of n). Hint: the pattern f &. g is equivalent to g'(f(g(x))) where g' here means inverse function of g. Hint: */ is the inverse of q:. Hint: the leftmost * hooks in the argument itself. The verb # is the same boolean selector we've used above. The verb 1: simply returns 1 no matter its argument. The fork pattern converts h f g (x) to f(h(x), g(x)). Here we have a fork on the left of # with h, f and g as 1:, =, and (+. i.) respectively. Then we have another fork with h, f and g as the results of the first fork, # and i. respectively. This is a more advanced style of J programming than we need for this introductory essay. note use of =. instead of =: in the function body. This is 'local assignment' -- storage is temporary to function execution -- whereas =: means 'global assignment' (variables accessible throughout the session). these properties are sometimes labeled C A I N for closure, associative, inverse and neutral, which is a Bible-related mnemonic, especially if you recall the other protagonist in that story was Abel (reminds us of Abelian). If you're not into Bible stories, nevermind.